“Everything is gift,” Kate Fletcher, founder of Hekima Place, shared with graduates of Duquesne University. At the age of 72, living and working in Kenya, far from her American roots, Kate had had an epiphany. Looking around her in her African home, she realized that everything she had and everything around her is gift. “Be grateful for everything,” she offered. Her words touched me. While the message was not a new one to me, it was a reminder to value and appreciate what is so easy to take for granted. Kate’s advice to the audience was to cherish all we have and all that touches our lives. 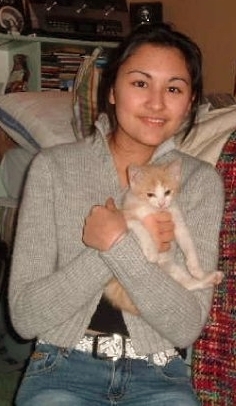 Several years ago my husband’s oldest daughter, Theoden, brought a wonderful Christmas gift to my daughter, Gabrielle. Bundled in (and dwarfed by) a Santa hat, a tiny tan and white tabby kitten entered our home and into our hearts. Theoden had known that Gabrielle had always wanted to have a cat, and also that she had been going through a difficult time in her life. For Gab there had been many sad days and few happy ones, it seemed. But that was to change, in part because of Theo’s thoughtful gift, the little kitty Gabrielle named Mango. At first, Gabrielle was a little intimidated by Mango. He was a wee creature who had little teeth and claws, who was delicate and needed care. Gab had never cared for a pet before, and Mango was going to need her to give him medicine, clip his nails, feed him, and introduce him to the litter box. She would need to give him play time, teach him where it was okay to sharpen his claws (none of us ever had 100% success there – the wallpaper is a testament to that), and provide him with comfortable places to rest his sweet head. In no time the intimidation Gab felt was replaced by pure love and commitment to Mango, and with her nurturing, Mango grew to be a wonderful adult cat. That’s what I have loved about Mango; he received Gabrielle’s unconditional love and gave her a focus to devote her time and attention. He pulled her away from herself and helped her to find joy during a challenging time. 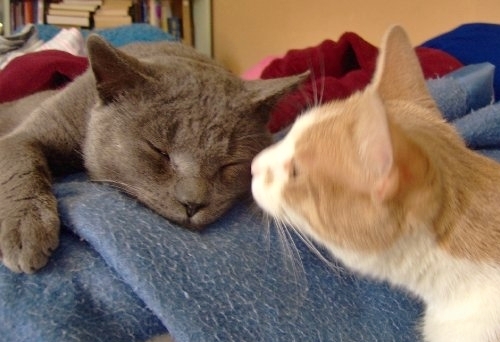 In his simple, adorable kitten-y way, Mango brought Gabrielle happiness. And in that way, Mango brought me happiness, too. Theoden’s thoughtful and meaningful gift made my daughter happy and gave her hope. Last week as my husband and I were preparing to travel to see Gabrielle graduate, I felt worried about leaving our cats. Mango had been in poor health, losing weight and showing little interest in eating and drinking. We had been to the vet, but the test results were inconclusive. For weeks we had encouraged Mango to eat and had given him lots of TLC, but I felt that we were losing the battle. 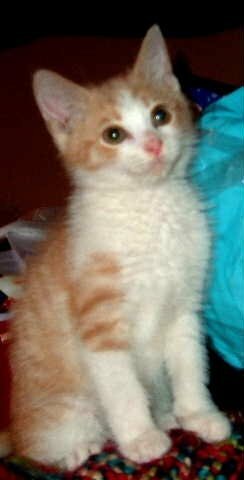 So during the time that we would be away, I arranged for my husband’s older son, Kidron, to spend time with the cats and look out for Mango. In recent weeks, I had tried to gently share information about Mango’s condition with Gabrielle, but now I wasn’t certain that he would make it through the weekend for her to see him. I had been walking around with a heavy heart but the morning we left, Mango surprised us by coming to the food bowl three times! It was a good sign that gave me a small feeling of hope. When we came home from our trip we were pleased to see that the cats had fared as well as could be expected, thanks to Kidron. Gabrielle now had the chance to see her friend, and of course realize that his condition was not good. It was very hard for her, and for all of us, because Mango was only six years old. Many house cats live to be twelve to fifteen years old, sometimes older. Gabrielle had the chance to spend the rest of the weekend with Mango, giving him the love and attention she had always shown him. But on Monday his condition changed noticeably. Mango was dying and there was nothing we could do but to make him as comfortable as possible. Our hearts broke, but we stayed with him until the end. Mango passed away Monday evening. Gabrielle and I truly believe that Mango held on for her, waiting for her to see him one last time. 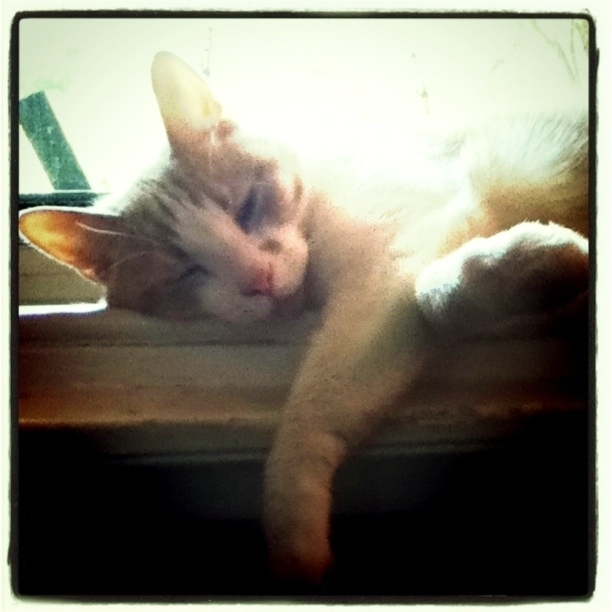 Mango loved soaking up the sun, and the windowsill was one of his favorite spots. Everything is gift. I believe that. Mango was a gift to us in every way. He brought out our goodness and love, showed us joy in his innocence, and is teaching us now how to grieve and face loss. We miss Mango every day – his chirping at the sound of a can being opened, his hopping and running away from my husband when being approached, and his playful sparring with Charcoal – but we are extremely grateful that he has been a part of our lives. Life, in every form, is a gift. Thank you, Mango for allowing us to be a part of yours and bringing so much joy to ours. Thank you for writing this beautiful piece about Mango. 🙂 He was a beloved cat, and I’m incredibly grateful for the joy he brought into our lives. You’re welcome. Gabrielle, I still find myself thinking about him at least once every day. His absence reminds me that life is temporal, and that the time to appreciate the ones we love (humans and pets alike) is now, in the present moment.